The Ketogenic diet is an extremely popular diet. The diet is easy to follow, helps you lose weight and brings you so many health benefits. The Crock Pot is a favorite kitchen appliance that makes keto cooking easier, especially if for busy moms or working professionals. If you maintain a busy lifestyle and have only a few minutes to prepare cooking items, then this Crock Pot cookbook is for you. This Crock Pot cookbook combines Keto diet and Crock Pot cooking to provide you with easy and healthy recipes, which are all Keto friendly and time-saving. The Keto Crock Pot Cookbook includes a diverse range of delicious right Ketogenic dishes that quick and easy to prepare and tastes fantastic. This cookbook offers you the most affordable, delicious, and easy 101 ketogenic recipes to your kitchen. Each of the ketogenic diet recipes includes a complete ingredient list and detailed, step-by-step instructions, nutritional Information and photos for each recipe. With keto, losing weight is not hard, and this The Keto Diet Crock Pot Cookbook makes it even easier. Inside this book, you will find all the information you will need to get the best out of your Crock Pot. Additionally, you will be surprised how many tasty recipes you find in this easy Crock Pot cookbook. 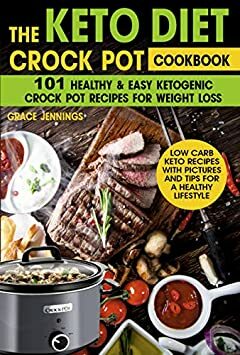 Get your hands on this amazing ketogenic Crock Pot cookbook and start your new and healthy life!